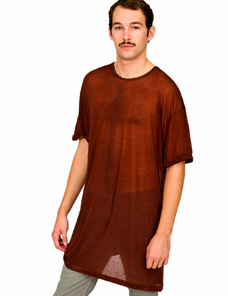 This is the new 'oversized ringer see thru t-shirt' by American Apparel. It unfortunately doesn't come with the moustache; you must supply your own. I do believe this shirt requires a moustache for the proper accessorizing. Observe how the brown of the moustache and the brown of the shirt complement each other. I find this image emotionally moving. A perfect companion to your yellow or brown Crocs. Posted by Vincenzo Ravina at 2:24 p.m. Brilliant! The see thru shirt allows the mustache to be complemented by the line of chest hair running down to the belly button. ugh - that is SO horrid!! WHY DO U HATE CROCS SO MUCH. Have u ever tried them on? they are very very comfortable you know. and they all dont look like the clogs ur thinking of. Nice. I like the way you collected all the information. Very informative! The see thru shirt allows the mustache to be complemented by the line of chest hair running down to the belly button. I guess this shirt is perfect for summer. It so hot during summer and thin clothes could lessen the warmness. Haha this is funny though awful, this is too transparent. Cute :) It is my first time to saw a man wearing a see through blouse. It is so cool. someone suggested this online store for buying my favourite Casio G Shock GAS-100BR-1A.Can any one guide me this site is good or not...? ?